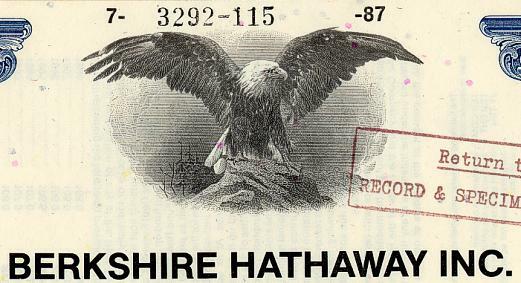 Beautiful engraved RARE Specimen 10% Bond Certificate from Berkshire Hathaway Inc dated 1987. This historic document was printed by American Bank Note Company and has an ornate border around it with a vignette of an eagle. This item has the printed signature of the Company's Chairman, Warren Buffet and is over 20 years old. This is the first time we have had this bond certificate for sale and believe it to be quite rare. Berkshire Hathaway (NYSE: BRKA, NYSE: BRKB) is a large holding company headquartered in Omaha, Nebraska, USA, that oversees and manages a number of subsidiary companies. Berkshire Hathaway's core business is insurance, including property and casualty insurance, reinsurance and specialty nonstandard insurance. The Company averaged a phenomenal 25%+ annual return to its shareholders for the last 25 years while employing large amounts of capital and minimal debt. The company is controlled by Warren Buffett, who is one of the most celebrated investors in history and the second-richest man in the world according to Forbes magazine. Buffett has used the "float" provided by Berkshire Hathaway's insurance operations (a policyholder's money which it holds temporarily until claims are paid out) to finance his investments. In the early part of his career at Berkshire, he focused on long-term investments in publicly quoted stocks, but more recently has turned to buying whole companies. Berkshire now owns a diverse range of businesses including candy production and sales at retail, newspaper publishing, retailing of home furnishings, sales of encyclopedias, sales of vacuum cleaners, manufacture and distribution of uniforms, retail jewelry, and manufacture, import and distribution of footwear. The Hathaway Manufacturing Company was founded in 1888 in New Bedford, Massachusetts by Horatio Hathaway, as a cotton milling business. The company was successful in its first decades, but suffered during a general decline in the textile industry after World War I. At this time, the company was run by Seabury Stanton, whose investment and effort were rewarded with renewed profitability after the Depression. In 1955, Hathaway merged with Berkshire Fine Spinning Associates, another textile company that was founded in Valley Falls, Rhode Island (and earlier called the Valley Falls Company) by members of the Chace family in the early nineteenth century. Berkshire Hathaway now had 15 plants employing over 12,000 workers with over $120 million in revenue, and was headquartered in New Bedford, Massachusetts. However, seven of those locations were closed by the end of the decade, accompanied by large layoffs. In 1962, Warren Buffett, convinced that it was trading at less than its real value, began buying stock in Berkshire Hathaway. After some clashes with the Stanton family, he bought up enough shares to change the management, and soon controlled the company. Buffett maintained BH's core business of textile milling, but by 1967 was expanding into the insurance industry and other investments. Berkshire first ventured into the insurance business with the purchase of National Indemnity Company. In the late 1970s, Berkshire acquired an equity stake in the Government Employees Insurance Company (GEICO), which forms the core of its insurance operations today (and is a major source of capital for BH's other investments). In 1985, the last textile operations (BH's historic core) were shut down. Berkshire's Class A shares sell for over $100,000 apiece, making them the highest-priced shares on the New York Stock Exchange. This is because they have never had a stock split. On October 23, 2006 shares closed at $100,000 for the first time. The Intrinsivaluator site, calculates four valuation metrics for Berkshire, giving estimates from a liquidation value of $87,277 per A share ($2,909 per B share) to an optimistic intrinsic value of $181,817 per A share ($6,061 per B share). All figures as of November 11, 2006. Berkshire's CEO, Warren Buffett, is respected for his investment prowess and his deep understanding of a wide spectrum of businesses. His annual chairman letters are read and quoted widely. As of 2005, Buffett owns 38% of Berkshire Hathaway. Berkshire's Vice-Chairman Charlie Munger also holds a stake big enough to make him a billionaire, and early investments in Berkshire by David Gottesman and Franklin Otis Booth resulted in their becoming billionaires as well. Berkshire Hathaway is notable in that it has never split its shares, which not only contributed to their high per-share price but also significantly reduced the liquidity of the stock. But despite its size, it is not included in broad stock market indexes such as the S&P 500. However, Berkshire Hathaway has created a Class B stock, with an ownership value of 1/30th of that of the original shares (now Class A) and 1/200th of the per-share voting rights. Holders of Class A stock are allowed to convert their stock to Class B, though not vice versa. Berkshire's annual shareholders' meetings, taking place in the Qwest Center in Omaha, Nebraska, are routinely visited by 20,000 people. The meetings, known for their humor and light-heartedness, typically start with a movie made for Berkshire shareholders. The 2004 movie featured Arnold Schwarzenegger in the role of 'The Warrenator' who travels through time to stop Buffett and Munger's attempt to save the world from a "mega" corporation formed by Microsoft-Starbucks-Wal-Mart. Schwarzenegger is later shown arguing in gym with Buffett regarding Proposition 13. The 2006 movie depicted actresses Jamie Lee Curtis and Nicollette Sheridan lusting after Munger.